I definitely feel like we have hit the right combination of reading material with my daughter – she loves reading non-fiction as well as historical based stories, stories with a slight adventure and stories with strong women characters. But my son seems to be very much an animal based reader – ie anything and everything about animals. And although I am thrilled that he is reading the way that he does I really want to try to broaden his reading topics, but he is proving more of a challenge. 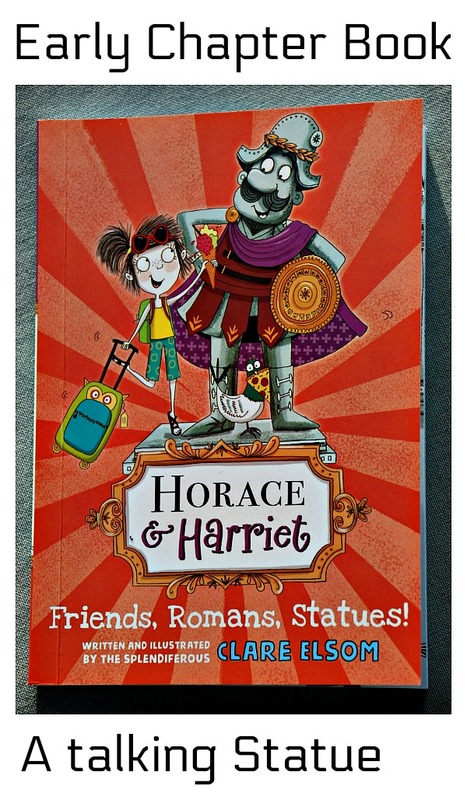 The one thing that I have picked up on is his need for a fictional stories to include some humour so I was intrigued when I heard about Horace and Harriet: Friends, Romans, Statues! (Horace & Harriet) – I mean a talking statue – I immediately imagine some funny incidents. So we tried our first one and – the very first page they introduce the statue and his long-winded name includes Nincompoop – well that immediately got a chuckle from my son and the book had his interest. The Story is about a walking, talking statue who thinks quite highly of himself. He follows his friends to Rome and has an adventure discovering a long-lost relative. It is a sweet story but what got my son was the humour – he loved the section when someone labelled the statues bottom – Heavy Load and when Horace, the statue goes around Rome putting tablecloths on all the naked statues and there are a bunch of other funny incidents but that would give the whole story away. It is a great early chapter book (115 pages) and it does include some more challenging reading words and lots of great references to places in Rome, Roman numerals and a few Italian words (some sneaky learning included here). 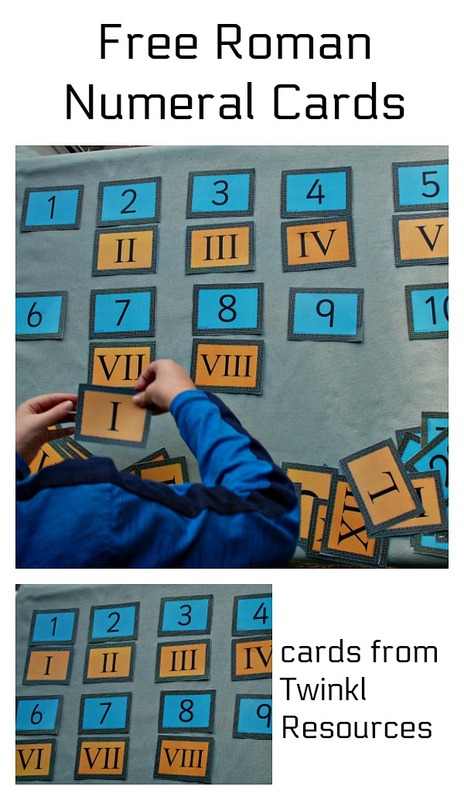 One of the great things was after reading the book my son wanted to learn more about Roman Numerals (he loved the chapter headings). We have actually covered Roman Numerals (Roman Coins) before but it was 2 years ago and he really only remembered a few basics. He did not remember the pattern that if the smaller number is in front you take it away and it if the smaller number comes after a bigger number you add it. 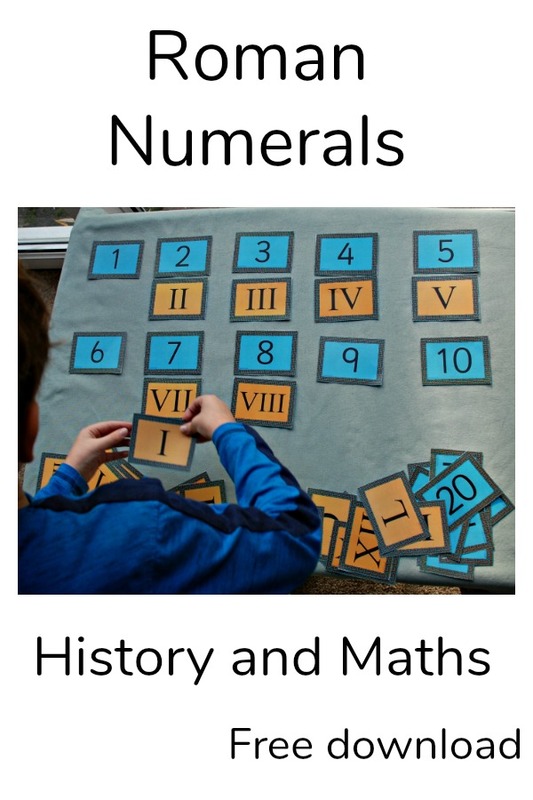 So I had a quick look on the internet and I discovered two lovely Roman Numeral printouts which are FREE to download from Twinkl Resources (you need to set up a free account to download their free resources). The first are these Roman Numeral scrolls. My son is going through a craze where he loves creating scrolls – really we have scrolls filled with times table practice, different ones with writing, some with maps drawn on them. He Loves scrolls so I knew he would appreciate having the Roman numbers on a Scroll. And in case you are wondering they have actually been cut out and rolled into scrolls. And I must say the matching cards really worked well. My son quickly picked up the pattern and was soon creating his own more complex numbers using Roman Numerals. The Admin Bit – Oxford University Press sent us the copy Horace and Harriet so my little reader could test it out. The links included to Twinkl Resources are correct at the time of me writing this post. Twinkl do change their resources from time to time and they can also change what is included in each subscription package. This entry was posted in Homeschooling and tagged children's book, free printables, home ed, home education, homeschooling, Twinkl. Bookmark the permalink. Sounds like a great chapter book and what fun resources for Rome. I love the scrolls.